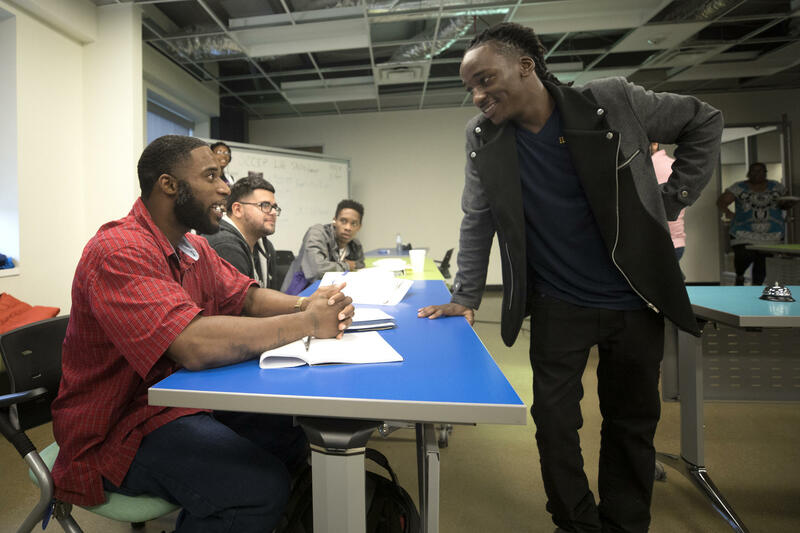 The Second Chance Community Improvement Program in Dallas is an alternative to incarceration for young adults charged with nonviolent felonies and misdemeanors. Of the 45 or so participants in the program since 2014, none has reoffended. About 20 young people sit across from one another in two teams in a community room at CitySquare Opportunity Center in South Dallas. Deontra Wade walks around the room with notecards in hand and asks everyone about themselves, using his best Steve Harvey voice. They laugh and tease each other. Wade runs around the room and high-fives everyone before standing at the front of the room and asking: "Name something people like to do when listening to music?" For outsiders, this may just sound like a fun game of "Family Feud" – which it is ­– but for participants in the room, it’s part of a pretrial initiative for 17-to-30-year-olds called the Second Chance Community Improvement Program, or SCCIP. 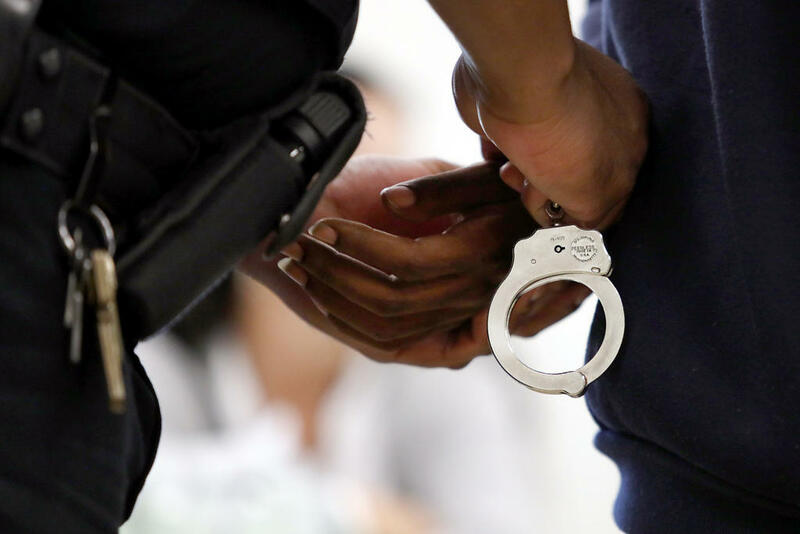 The Dallas County program, which began in 2014, is an alternative to incarceration for young adults charged with nonviolent felonies or misdemeanors. The program targets the county’s four most impoverished and heavily minority ZIP codes – 75210, 75215, 75216 and 75223. SCCIP provides individualized community-based resources to prevent young adults from getting caught up in the criminal justice system and help them make better choices. In 2016, SCCIP introduced the first felony community court in Dallas County, which is held in the same community room of the Opportunity Center. Participants in the program are required to attend court dates and group sessions, stick to established goals and perform community service, among other things. They also must choose either to pursue an education or find a job. If it's determined that they've met all the requirements, their records are expunged. Deontra Wade hosts a game of "Family Feud" with participants of the Second Chance Community Improvement Program in Dallas. For Wade, who is a bit of a funny guy, the opportunity to join SCCIP was no laughing matter. He had been in jail for two weeks on theft and drug charges, unable to afford bond. One day, a guard told him he had a visitor. It came as a surprise, he said, because no one knew he was there. It was his public defender. He told Wade about SCCIP, and he agreed to participate. He got out of jail the next day. Wade has been in the program now since June 2017 and is scheduled to graduate in June. Nearly 200 miles away, District Court Judge Stacey Mathews has been researching programs like SCCIP to see what can be done in Williamson County. The county has been working with the Lone Star Justice Alliance to reduce recidivism among young offenders. According to Mathews, 85 percent of young people who are convicted of a crime in Williamson County are re-arrested. Eighty-five percent of young people who are convicted of a crime in Williamson County are re-arrested, according to District Court Judge Stacey Mathews. LSJA saw that Dallas County already had a similar initiative and invited the county to join in a study with Williamson. The counties will look at ways to reroute young adults out of the criminal justice system and evaluate how health, mental health and family structure affect productivity in a community. In partnership with LSJA, the study will be conducted by the Public Policy Research Institute at Texas A&M University, Harvard University's Access to Justice Lab and the University of Texas School of Public Health's Health Science Center. The study is the first of its kind in the U.S. in 40 years, according to Elizabeth Henneke, LSJA's executive director. “This is [also] the first time in the country – and actually we believe in the world – that a program like this is actually launching from inception with a randomized control trial evaluation,” she said. Each county will receive nearly $1.6 million from the Texas Indigent Defense Commission to run their free programs for four years. On Tuesday, the Williamson County Commissioners Court unanimously approved almost $386,000 in funding for a program manager, social worker, two defense counsels and countywide training. According to Texas numbers in one report, 75 percent of young adults put on probation for felony offenses were reincarcerated within three years, and only 18 percent of 17-to-21-year-olds fully completed probation in 2017. "Many of these folks are not only someone's child, they're someone's parent." Henneke said that's partially because the state is one of four in the country to automatically send 17-year-olds to the adult criminal justice system. She said that has consequences for families. Henneke said the length of probation, high costs and strict guidelines can be challenging. “It's a population with incredible numbers of housing instability, challenges with workforce and education, challenges with trauma and challenges in general with mental health,” she said. The reports emphasize keeping young adult probationers within the community. Research shows that when communities provide services to young adults during probation or any other rehabilitation, it’s more effective. Henneke said it also saves taxpayers money, which is what partially attracted Williamson County. Molita Strong, SCCIP's only current case manager, said she’s ground zero for those entering the program. Strong is responsible for weekly meetings with participants, writing court reports, interacting with parents and connecting participants with resources. She also collects data and information on referrals. She said the job isn’t easy. 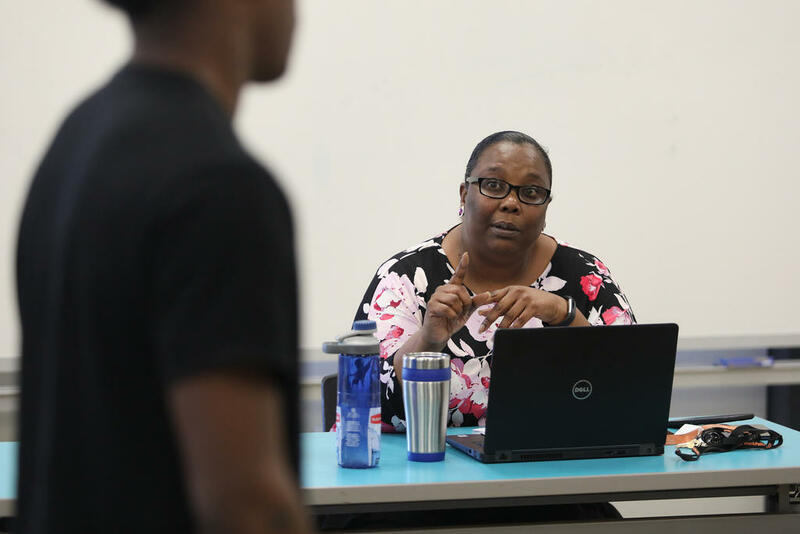 Molita Strong is the only case manager for Dallas County's Second Chance Community Involvement Program, which helps young adults from getting caught up in the criminal justice system and make better choices. Strong, who struggled with addiction in her early 20s, said she has been clean for almost 30 years. She said many of the participants are dealing with trauma, and she understands that. “So much pain and just failure,” she said. “You don’t get to quit us. We get to quit you because they’re used to ... giving up when it gets tough." There have been around 45 participants in the program to date and no one has reoffended, according to SCCIP. Back in group session, just minutes before "Family Feud," participants write down obligations on a calendar and turn it in. Strong says this helps hold them accountable and teaches organization. Wade said when he first began the program, it wasn’t easy. Wade said he would miss appointments, fail drug tests and lie. Now, he works at the cafe across the courtyard. He’s taking GED classes and wants to enroll in trade school for audio engineering. Now he just practices with apps on his phone. The LSJA study of the programs is expected to be completed in four years. “We believe that it will provide feedback – not only how this program works but also feedback generally on whether community-based services can provide a true alternative to incarceration that has long-term impact," Henneke said. Mathews said she hopes Williamson County can prove true to that notion. Corrections: This story initially stated the Williamson County Commissioners Court unanimously approved almost $386 million in funding. The correct number is $386,000. An earlier version of a photo caption of Judge Stephanie Mitchell misidentified her as Judge Stacey Mathews. An earlier version of this story said only one SCCIP participant has reoffended. According to the program, no one has. Williamson County is leading the state when it comes to the percentage of registered voters casting ballots in-person during the first two days of early voting. Experts say that's a sign political groups are paying more attention to suburban counties near major cities across the U.S. The federal prison inmate population is about 183,000. That could be cut by almost a third in the course of one year, if lawmakers on Capitol Hill succeed in passing a new law. Monday, Texas Republican Sen. John Cornyn acting as majority whip – the number two leader in the Senate – delivered an impassioned speech calling for passage of the First Step Act. It's a first step toward major criminal justice reform.